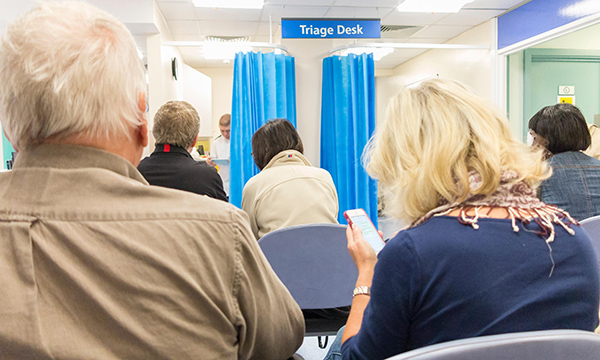 Long waits in emergency departments are just part of a burgeoning problem. RCEM took this unprecedented step after data released last week showed the worst ever four-hour emergency care performance at just 76.9% at major EDs. Overall, just 85% of patients were admitted, transferred or discharged within four hours of arrival in EDs in February, figures released by NHS England showed. The target of 95% has not been met since July 2015. This winter has seen the worst flu season since 2011, with 306 confirmed deaths according to Public Health England. Thousands of people have also been affected by norovirus, leading to hundreds of hospital beds being closed every day. But Dr Hassan added: 'The current crisis was wholly predictable and is due to a failure to prioritise the need to increase healthcare funding on an urgent basis. Nigel Edwards, chief executive of healthcare charity the Nuffield Trust, added that the immense pressures seen this winter were fundamentally driven by a lack of money and staff. 'If these are not addressed it is inevitable that, as difficult as February has been for NHS staff and patients, there will be worse to come,' he warned. RCN general secretary Janet Davies said the figures show there is 'no more to give'. 'Safe staffing levels are key to patient safety, and immediate investment is required to train and retain staff,' she said. Experts expressed concern that bed occupancy rates were at an average of 95% during February, above the 85% limit considered safe. The Royal College of Surgeons said at least 62,000 fewer NHS treatments, including surgical operations, were performed by consultants this winter compared to the previous winter. In trauma and orthopaedics, there was an 8.4% fall in treatments. It said the 'necessary evil' of postponing all planned surgery in January to relieve pressure on EDs resulted in many patients not receiving treatment when they needed it, 'extending their time in pain or discomfort'.